Beautiful Users focuses on human-centered design. It investigates the wide variety of ways in which designers learn about challenges that users face, build empathy for those users, prototype and test design solutions, and, ultimately, change lives. 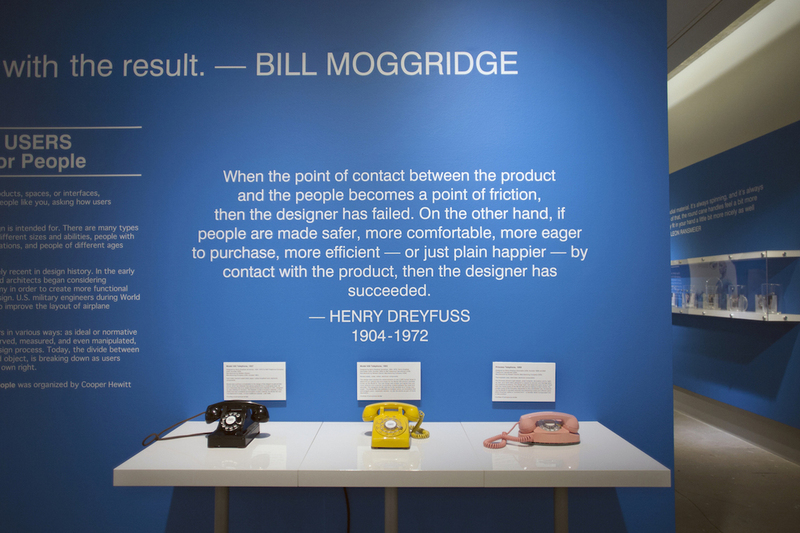 In ways that are witty and surprising, the exhibition also reminds us that the designer-user relationship is being renegotiated in our contemporary world. Technologies like 3D printing and information archives like YouTube are making it easier and easier for users to re-design or "hack" consumer products so that they meet their own very specific needs. Rather than presenting a continuous narrative, Beautiful Users is episodic in nature. It presents a wide variety of objects, all of which are common in everyday life, from telephones to an innovative door lock and wifi doorbell cam, from hacked vacuum cleaners to 3D-printed shoes and jewelry, and from a low-cost prosthetic system made of materials like bamboo and canvas to prototypes for an elegant bathroom fixture. Another thing we love about this exhibition is its explicit approach to design thinking, a skill we believe is essential for individuals in the 21st century. The design thinking methodology is explained in a wall graphic and is illustrated by cases of objects used or developed by IDEO or IOMAI in the process of designing a new immunization system. It's a great way for visitors to take a deep dive into the traits and skills that are essential to the design process, including empathetic understanding of user needs, iterative thinking and making, and testing and refining prototypes . We're using this wall as a teaching tool in our classes and tours for these are the skills and competencies around which our education program is built. See Beautiful Users at MODA through October 2. Click here for more information. Oct 7 Make a Poster. Make a Difference.